This is the skirt I’m working on right now, Simplicity 2452. It’s part of my TNT project (the search for work wardrobe basics that fit well, look good and that I can make over and over again). It’s a simple, no waist band, 4 dart, 3 piece, pencil skirt with vent pattern. I’ve had my doubts about this pattern along the way, but with proper fitting and the right fabric, I think it can be a winner. However, as my close friends and family will no doubt attest, I have this habit of complicating things. I know. Weird, right? So I took this simple skirt and complicated it up by adding a lining and thinking I am really smart to add a grosgrain ribbon at the waist to stabilize it. I’ve added linings before to patterns. Sure it’s a lot of extra steps, but it’s relatively easy. Easy that is, if you use a simple, plain vanilla pattern. I know what you’re thinking: “Didn’t she just say that this skirt was simple?” Why yes, I did, but I also said it had a vent, didn’t I? A vent in and of itself is relatively harmless and quite useful to have if you want to walk while wearing your pencil skirt. 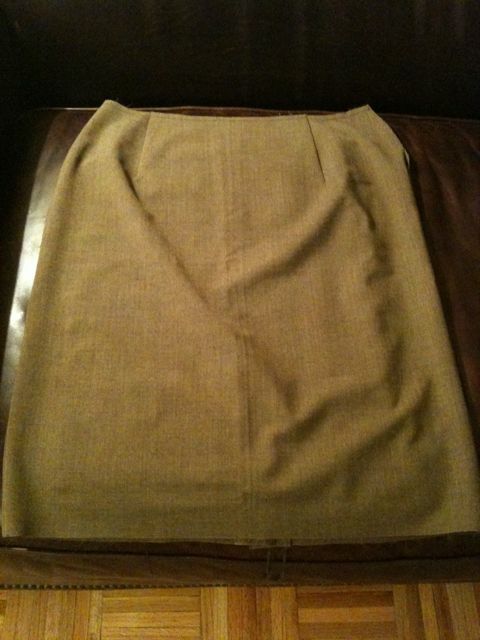 But when you want to add a lining, the vent on this otherwise innocuous and simple skirt becomes quite troublesome. I was patting myself on the back that I remembered to construct the lining with the vent going the exact opposite direction of the skirt so it would mirror image it when put together, until Thea, my teacher and I started to work on adding the ribbon and lining last night. That’s when I realized, I should not have finished the vents on the fabric and lining independently of each other. Let me tell you who my nemesis is when it comes to sewing: ORDER. OF. CONSTRUCTION. I know that eventually I won’t make these stupid mistakes, but really. Why can’t these patterns come with lining instructions???? Is it too much to ask that someone else do my thinking for me ahead of time? Really??? Sheesh! I am chalking this skirt up as a learning experience. I am not undoing the vents and then sewing them back together. I am going to wear it as is dammit. And I am going to wear it proudly. No one’s going to know but me and I really stitched those vents closed but good. It would take hours of unpicking to get them apart again. I sewed it down with several lines of stitching each to make sure they wouldn’t rip apart. And boy am I sure now. In other sewing news, Thea and I figured out a work around for the Knip Mode skirt. But I will save that story for another time. This entry was posted in Beginner, Simplicity, Skirts, Thea, TNT's, Work Wardrobe. Bookmark the permalink. Looks great! Can’t wait to see it modeled. Have you ever seen the book “The Easy Guide to Sewing Linings” by Connie Long? It’s out of print now but they sell it on the Taunton web site for $13.99 as a pdf e-book. It’s here: http://store.taunton.com/onlinestore/item/easy-guide-to-sewing-linings-connie-long-ebook-077748.html. I think you would really like it. I bought it and it looks like a great reference book. It looks good! I too can’t wait to see it on you. What’s a sewing experience if you don’t learn a thang! Does your fabric have little flecks of brown in it, and is it linen? I think I just bought something similar to it. I love your skirt. As TG says “Make it work!” and you did. I loved the story because I went through a similar thing while making my grey dress. I added elements like piping and a lining. I love the vanilla skirt and think it is a great wardrobe builder. You Go Girl! It’s coming along great! I’m adding lining to my first skirt that didn’t have lining instructions and it’s coming along interestingly… I currently have a very hap-hazard method. Hehe.. that’s how we learn. 🙂 Good luck!